44% of GOP voters believe state and local officials are prepared to combat cyberthreats, down 6 percentage points from a June poll. 51% of overall respondents said state and local officials, as well as political campaigns and committees, are not prepared to deal with election-related cyber threats. 47% of U.S. voters said Republican candidates are more likely to benefit from potential Russian meddling in the 2018 midterms. Majorities of U.S. voters believe state and local officials, as well as political campaigns and committees, are not prepared to combat cyberattacks or hacking efforts targeting the 2018 midterms, according to a new Morning Consult/Politico poll — with Republican voters in particular growing more skeptical about cyber preparedness in advance of the November elections. The survey, conducted July 19-23 among a national sample of 1,996 registered voters, comes after the U.S. Justice Department announced indictments against 12 Russian intelligence officers in the hacking of the Democratic National and Democratic Congressional Campaign committees and Hillary Clinton’s 2016 presidential campaign. Fifty-one percent of survey respondents said both election officials and campaign and committee officials are not prepared to deal with cyberthreats. Thirty-six percent said state and local officials are prepared and 35 percent said the same about political campaigns and committees. Despite news of the indictments, sentiments about election security are largely unchanged from Morning Consult/Politico polling conducted June 14-18 — except among Republican voters, who have grown less certain of election security and preparedness in the interim. 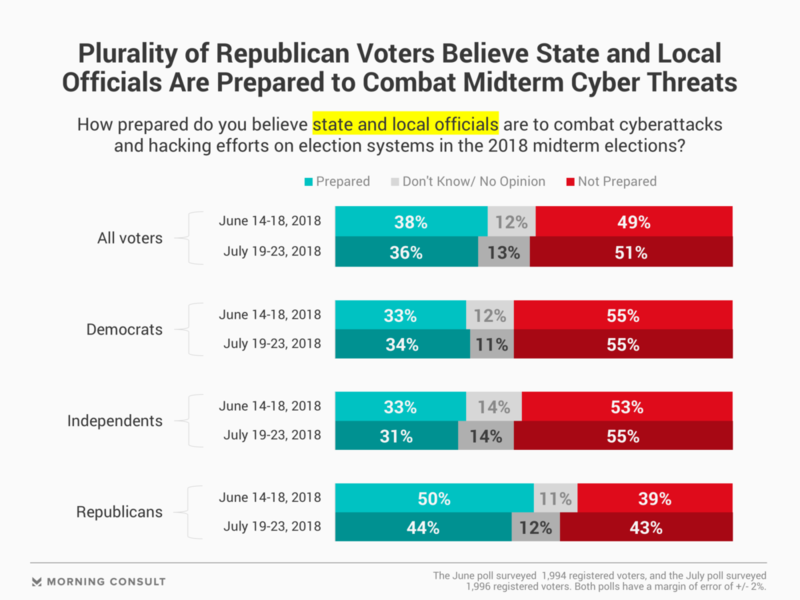 Forty-four percent of GOP voters believe state and local officials are prepared to combat cyberthreats, down 6 percentage points from last month’s poll. The share of Republicans who believe these officials are unprepared for such threats rose from 39 percent to 43 percent in the same time period. Similarly, the share of Republicans who believe political campaigns and committees are prepared to combat cyberthreats dropped 5 points, to 44 percent, while the share of those who said they were not prepared rose to 42 percent, up 4 points from June. Both polls have a margin of error of plus or minus 2 points. Andrew Grotto, an international security fellow at the Center for International Security and Cooperation at Stanford University, said that the narrower numbers could be from the absence of the word “Russia” from the question and the focus on cybersecurity. “It seems to me there isn’t much of a partisan divide over the basic question of how prepared election officials are to deal with cyber incidents, but the divide starts to surface when we start to use the R-word,” Grotto said in a phone interview Tuesday. A 47 percent plurality of voters in the latest survey said they believe Republican candidates are more likely to benefit from potential Russian meddling in the midterms, compared to 13 percent who said interference is more likely to help Democrats. Rep. Gerry Connolly (D-Va.) said he believes there’s “no question” that Republicans would be taking the cyberthreats more seriously if they had more of an impact on GOP candidates and institutions. “They’re enabling and rationalizing behavior that’s very damaging to the country, and I think turns a blind eye to a palpable threat from Russian interference,” Connolly said in a brief interview on Capitol Hill on Tuesday. While the 2016 election hacking efforts largely focused on Democrats, some GOP lawmakers are taking cybersecurity seriously as a result of Russia’s influence operations. Sen. Marco Rubio (R-Fla.), whose 2016 presidential campaign was also targeted by Russia-linked hackers, co-sponsored bipartisan legislation, S. 2313, this year that would impose sanctions on any country that interferes in U.S. elections. Despite voters’ concerns, state officials and party committees say they are more prepared to combat potential election cyberthreats in 2018 than they were in 2016. Raffi Krikorian, the DNC’s chief technology officer, said that the DNC has worked to improve its security following the 2016 cyberattack. “To protect our systems, we’ve worked to instill a complete culture change with our staff and offer better resources and guidance — to our own staffers and also to candidates, state parties, and the rest of the Democratic infrastructure, so our partners can better secure their own systems,” Krikorian said by email Tuesday.